The shortest day of the year – December 21st, is always cause for celebration. From now on, it can only get better – at least until June. Last year, we were under deep snow; this year, the garden is merely a soggy morass, and the piles of snow shovels in the shops remain unsold. Any colour at all is welcome – but there is very little. 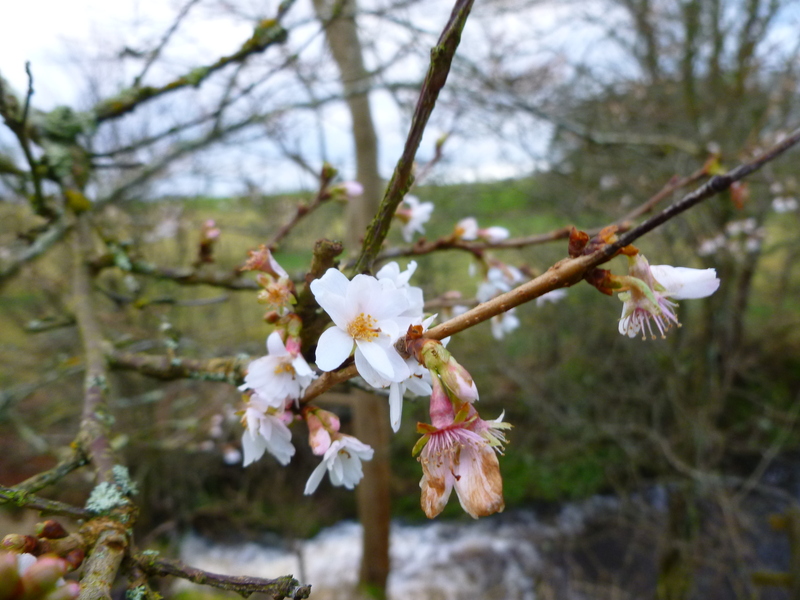 The last flowers of the Autumn-flowering cherry (Prunus subhirtella Autumnalis) are clinging on… ….but are looking very sad. This is a very useful small tree to have around, but mine suffers badly from fly or aphid attack every year, and never covers intself in blossom the way it should. 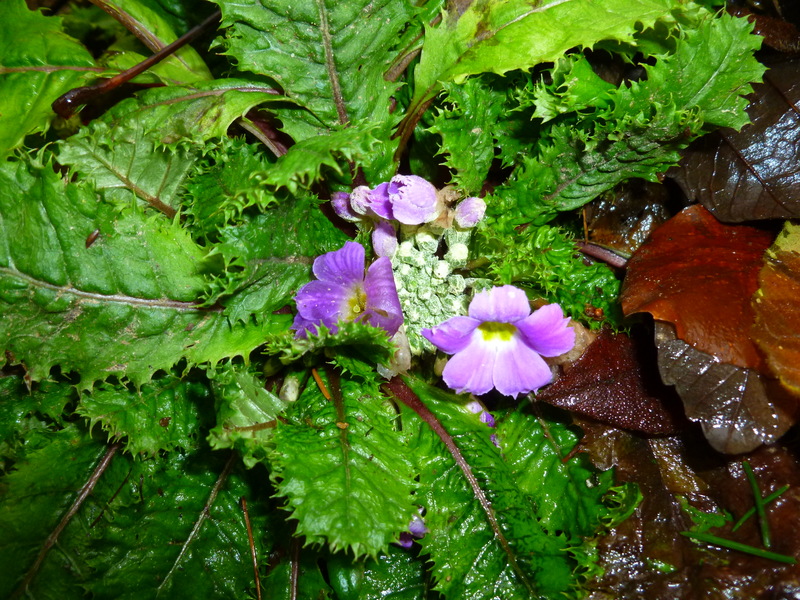 Primula bracteosa is another winter stalwart, and will put up with a lot of abuse and neglect, unlike most of its fellows in the Petiolaris section. When I went in search of it, it was hidden under a layer of soggy leaves, but pushing out flowers undaunted. 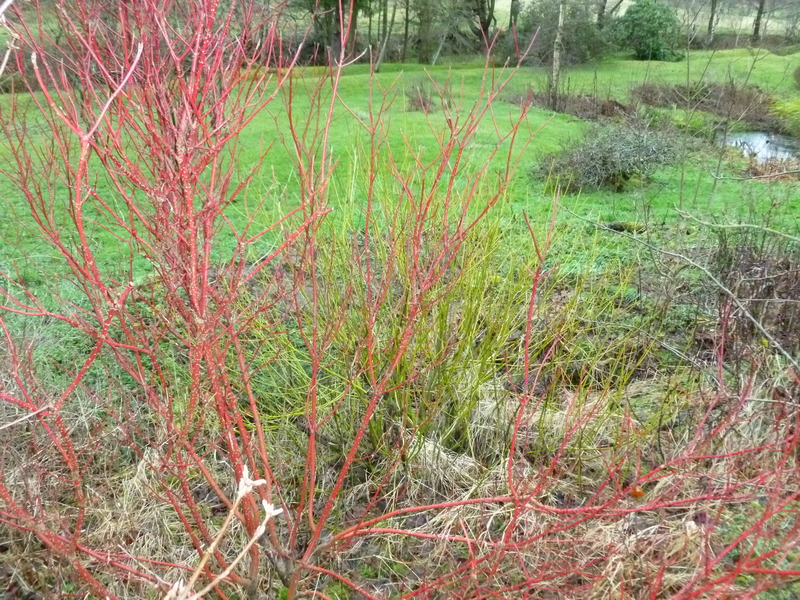 Dogwoods (cornus) also come into their own in this bleak season, especially the ‘Westonburt’ variety with its bright scarlet stems. The big, thicket-forming dogwoods are a bore to prune in spring, but repay attention by providing the best colour on their new shoots It continues to rain. 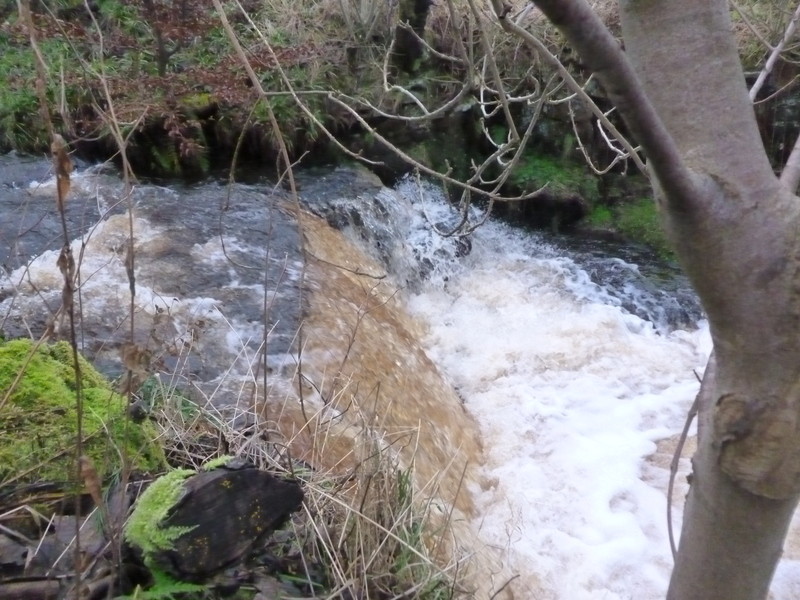 There is a waterfall at the back of the house, and the volume of sound tells me at once whether it has rained much the previous night. Its solid, dull roar can be heard all over the garden at the moment. I’m in two minds about forcing bulbs to provide some colour indoors. It is lovely to have paperwhite narcissi (narcissus papyraceus) or hyacinths in bloom over Christmas, but once over and planted out, the bulbs never seem to entirely recover. It is a bit like force-feeding geese for foie gras. 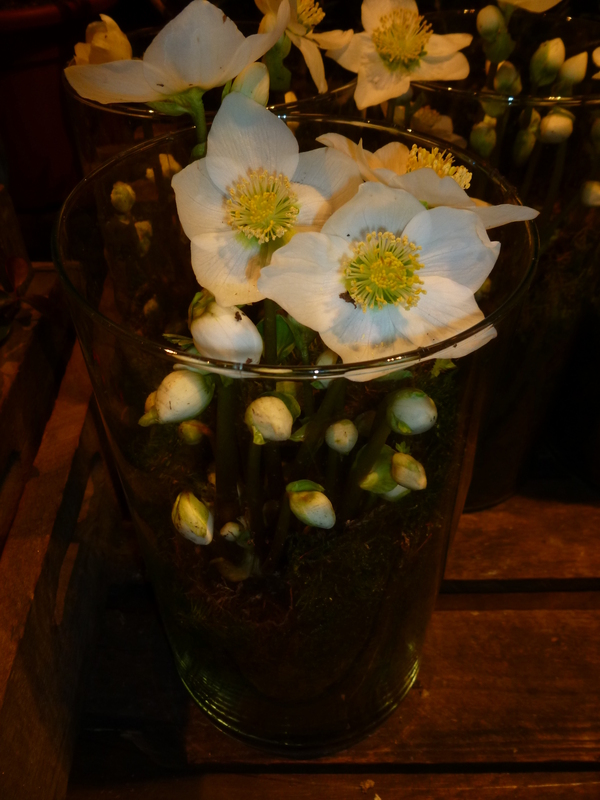 However, I did run across this hellebore in a glass vase in an up-market florist: By digging up a piece of suitable hellebore and bringing it indoors, I would probably be forcing it only by a couple of weeks – so it might be none the worse for the experience. Has anyone tried this? 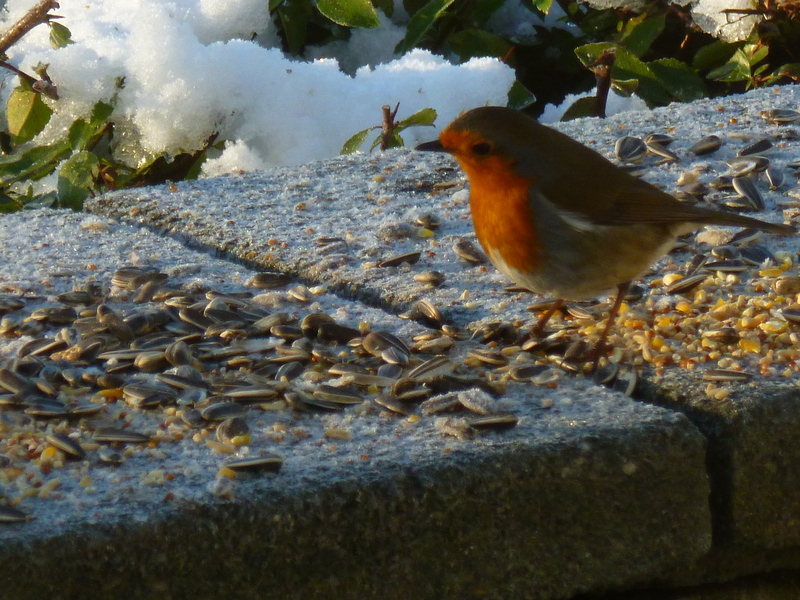 I leave you with a Christmas robin: Thanks for reading. I never would have thought of forcing hellebores as many of ours are out already. Hope you are enjoying Christmas. Mr K. Can’t believe you had time to post today. I’m trying to settle after too much Christmas dinner. I think the panacotta was the proverbial straw that broke the camel’s back.. hope you are having fun. Alas Janet – none of my hellebores have emerged. Forcing may be on the cards for next year! Hope you and yours are having a happy and peaceful Christmastime. It is beautiful to have a natural water feature in the garden and a waterfall is perfect! Is it far away from the main garden? I never force anything indoor, partly because I don’t like plants indoor, partly because I’m lazy and I forget to water them, partly because in winter I only see my house for a few moments in the morning and then after dusk, when I go back from work. In the morning I prefer watching the garden from the kitchen window while keeping a warm mug of tea in hand. It feels so good to me. The dogwood is above the pond. I actually have too much of it – and it’s horrible to cut out once it has formed a thicket. I’m glad you don’t like forcing – neither do I – but I think I should try the hellebore. Good job finding some blooms out there. Soggy here too–nowhere to go but up. Here’s to 2012! That’s a great idea with the Hellebore – let us know how it goes if you try it!